“We’re not going to make it. We need more stain,” Laura said. I detected a hint of resignation in her voice, and her glance my direction plainly said, I’m done with this and there’s no way in hell I’m going to go to Home Depot to get more stain. I looked at my watch and it was quarter to three. We had been sanding and staining the deck most of the day, and we were so close to finishing. Having procrastinated the task for the entire summer, I had been watching the weather for a day just warm enough to put a coat of stain on the peeling surface before the snow started to fall. This had been the perfect day, and even though it was early October, it was the only warm day in a string of cold, rainy days with threats of snow. We had worked diligently since the deck had dried from the morning dew, and in spite of having a head cold and feeling like she should have stayed in bed, my loyal daughter-in-law pulled up her boot straps and rolled stain like a trooper. Laura had spent a few summers in college painting parking lot stripes, so I considered her to be a “painting professional,” and had trusted her prediction that we would have enough stain to finish. But her declaration of the bucket’s emptiness was final, and time was running out. If I didn’t get more stain soon, we would lose light within a few hours, not to mention interest and energy. I pulled on a clean sweatshirt to cover my stained arms, grabbed my purse, keys and the paint bucket lid, and headed to Home Depot. Honestly, I wasn’t even sure what kind of stain I was supposed to buy; these details sometimes escape me. What I did notice, however, was that my pants were covered with spots of cappuccino-colored stain, and my hands were caked with blobs of the same color. My hair was pulled up in a pony-tail, covered by a baseball cap, and I had no makeup on. I hadn’t bothered to look in the mirror all day. It was Saturday--a work day--so why would I? I suddenly had the feeling that I shouldn’t be going out in public like this, and as I drove the ten minutes to Home Depot, continued the argument in my head. “I know,” I said, embarrassed. “Kind of a fun puzzle, huh?” I had taken a picture of the actual stain bucket, but left my phone behind, having placed it on the grill that I’d painted into a far corner of the deck. While I waited for him to compare the dried stain drips on the lid to his color charts, I looked around and saw many beautiful, freshly-showered, made-up women in clean, stylish clothes, and I felt even more self-conscious. It seemed like it took forever for the paint shaker to finish, and on any other day, I might have used the time to look at tile or new dishwashers. But I couldn’t wait to get out of there, and I couldn’t risk crossing paths with even a distant acquaintance who might smile politely and say, “Oh, dear, I hardly recognized you.” I was happy that the self-checkout wasn’t busy so I didn’t have to put myself in front of another human being in my less-than-perfect state. At The Villa, we decided after Confidence Camp that we wanted to focus on the theme, “Perfect is boring”, because in order to really build confidence, we have to get comfortable with our own imperfections. Being comfortable with our humanness allows us to be more vulnerable, connectable and authentic. A colleague recently sent me an article from the Harvard Business Review that described studies on brainstorming. The author said that two kinds of processes were evaluated to determine both the quantity and quality of ideas produced in a group brainstorm. In one group, the participants were each asked to share an embarrassing story with the group before they started contributing ideas. In the second group, participants were asked to tell the other group members about an accomplishment they were proud of. Essentially, the research determined that the groups who shared embarrassing stories before the brainstorm produced more ideas and better quality ideas than the groups who started with their accomplishments. It’s not difficult to understand why; when we recognize that other people have the same kinds of imperfections and human experiences we have, our inhibitions come down and we are more likely to offer ideas that we might otherwise hold back if we think they won’t meet a group’s standard. If we start by talking about our accomplishments, we hold each other in awe, and keep our masks on to appear more worthy of acceptance by the group. Had I gone into Home Depot and seen other paint-covered, dust-covered, baseball-capped women (as I’m sure they were there), I might have felt less self-conscious. After all, it’s not like going to Home Depot is the same as going to dinner at an expensive restaurant, and I seriously doubt that anyone really cared how I was dressed. But I surprised even myself with my own level of discomfort, and could only see the others that appeared to be better than I felt that day. 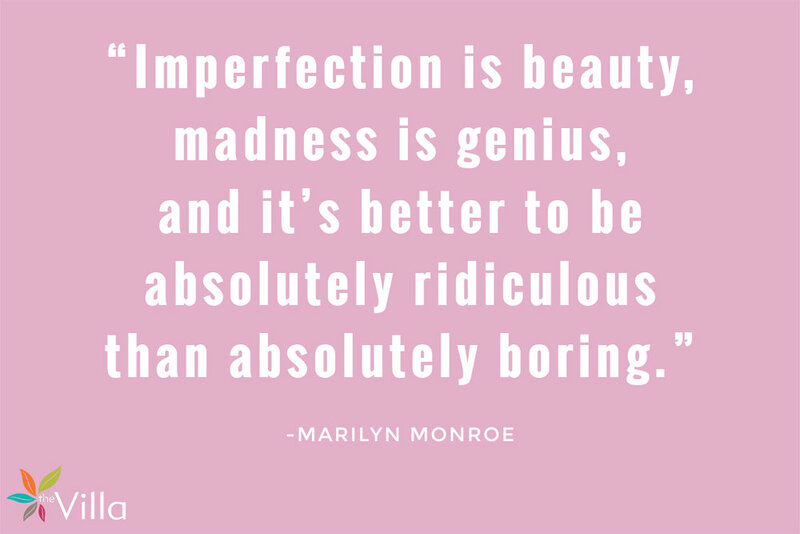 But seriously, perfection IS boring. Maybe there are places for perfection in “things”, because I do want my car’s engine to be perfectly engineered, or my friend’s knee replacement surgery to be perfectly executed. But perfection in being human may be an impossible goal, and our pursuit of perfection can set us up for always feeling “less than” and “not enough” if we compare ourselves to others or set unrealistic expectations for ourselves. You can send your stories to us anonymously or openly, with or without photographs. We will select from all the stories submitted and publish as many as we can on our blog. 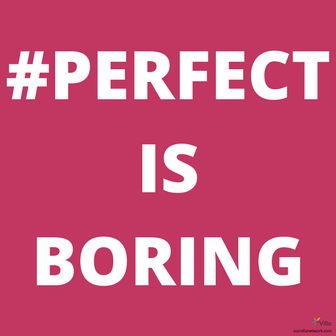 If we select your story to publish, we will send you a “Perfect is Boring” sticker. Submit your “Perfect is Boring” story by November 16, 2017 and you will also be entered to win a custom-designed silver bracelet inscribed with “Perfect is boring”. You can email your story to villaleadership@gmail.com or via the form on our website. Please visit this page before writing your story to review our guidelines.